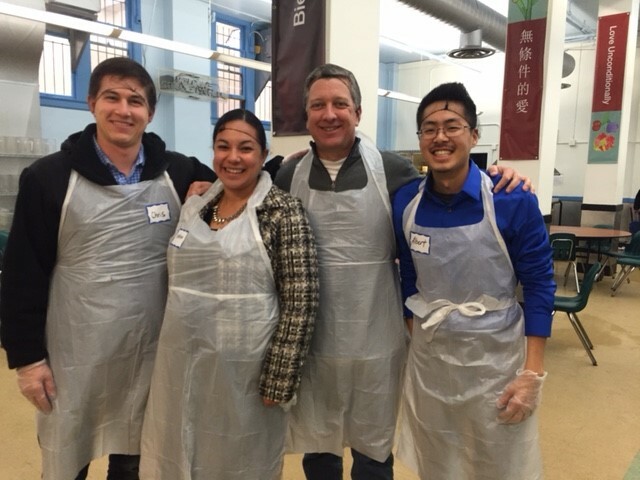 Albert Chen, Todd Angstadt, Andrea Reyna Murphy, and Chris McDonald volunteer at GLIDE Memorial United Methodist Church’s Food Program. Our firm recognizes that with success, comes social responsibility. The firm is committed to serving local, national and global communities and being a role model for positive change. Beyond our commitment to diversity, we also strive to respond to the needs of the community through our pro bono work. Initiated and developed by our associate attorneys, we assist individuals through nonprofit organizations that seek to facilitate legal services to those unable to obtain such services on their own. The firm is actively supportive of the Canal Alliance, an organization dedicated to protecting immigrant abandoned children from abuse and deportation. Numerous Phillips, Spallas & Angstadt LLP attorneys contribute significant time to pro bono appearances on behalf of the children. We help nonprofit organizations with their own legal needs in such areas as corporate formation, start up, and regulatory issues, including obtaining tax exempt status under the Internal Revenue Code and the California tax laws. Our attorneys have served on the boards of numerous nonprofit organizations such as the San Francisco Commission on the Status of Women, Tackling the Odds, Leadership Napa Valley, and Star Academy. The firm enjoys serving the local community and participating actively in charitable service. We provide ongoing support to Star Academy, a school that provides an intensive, individualized education programs for students with learning differences in grades 1-12. We have also recently provided support to the following: the Mill Valley Little League for children with learning differences; the Humane Society; the Tenderloin Neighborhood Development Corporation’s After-School Program, which provides a safe drop-in space for the children of the Tenderloin District; the Catherine Kasper Place in Indiana, the Choctaw Indian Mission in Mississippi and the Hydrocephalus Association. The firm annually participates in food drives and toy drives, as well as contributing financially when the need arises. The firm’s attorneys also serve on the boards of numerous nonprofit organizations such as the San Francisco Commission on the Status of Women, Tackling the Odds, Leadership Napa Valley, as well as Star Academy. We honor and recognize the commitment and sacrifice of those persons who serve, and have served, in the United States Armed Forces. While it is impossible to repay the debt owed our service personnel, we attempt to acknowledge their sacrifice by providing annual financial support to two renowned organizations which serve the needs of veterans. The National Military Family Association provides much needed medical and counseling services not only to veterans, but to the veterans’ families as well. The Fisher House Foundation provides free or low cost housing for veterans and military families receiving treatment at military medical centers. We contribute quarterly to the Marie Kerkeles Phillips Scholarship Fund, which is dedicated to funding education for African women pursuing higher degrees in public service fields, including social work, health sciences, and the ministry. Presently, the Scholarship is fully funding the education of two students attending Africa University full time. Africa University is located in Mutare, Zimbabwe. The firm is also sponsoring Jaiama Secondary School, located in Koidu Town which is in the remote eastern Kono District province of Sierra Leone. A brutal civil war destroyed the school, and the firm is working directly with Acting Principal A. A. Thomas to restore basic utilities, restore living quarters for students and teachers, and to provide scholarships for students wishing to attend classes. The firm also supports the Office of the United Nations High Commissioner for Refugees (UNHCR), also known as the UN Refugee Agency, which is the world’s leading organization aiding and protecting people forced to flee their homes due to violence, conflict and persecution.